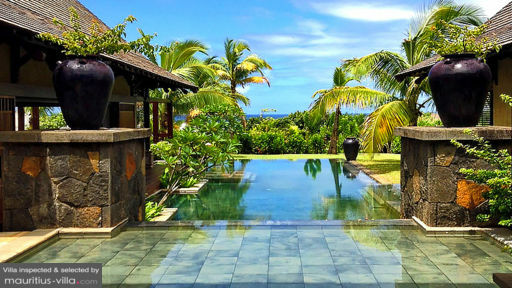 Perfectly structured to easily accommodate up to 14 people, Villa Laguna boasts calmness and serenity to provide you with the perfect vacation on the tropical island of Mauritius. Boasting charm and luxury, this villa is also perfect for larger group vacations. Guests of Villa Laguna can make the most out of the six air conditioned bedrooms, four of which include en-suite bathrooms and king-sized beds. The remaining two bedrooms include a queen-sized bed and two bunk beds respectively. These two bedrooms share one bathroom between them. In the master bedrooms, guests will also find a safe as well as a full-sized closet. At Villa Laguna, guests will be able to enjoy the comfort of a private swimming pool which they can dive into anytime they want. In fact, the villa itself has been structured in such a way so as to completely wrap around the infinity pool which overlooks the azure Indian Ocean. Gloriously cool and refreshing, the swimming pool offers the perfect respite from the tropical heat. In the outdoors area, you will also find a wooden deck which you can use to soak in as much sun as you’d like. With a plethora of water features to enhance a profound sense of relaxation, the garden also boasts small patios and a barbecue area for delectable dinners out with your friends and family. In the spacious yard, you’ll also find an outside shower, private parking, electric plancha, deck chairs and even an outside entertainment area. With a living area of 316 m², Villa Laguna offers an unblemished view of the turquoise ocean. In the villa, you will find a perfectly equipped kitchenette which you can use to easily whip up your own meals. Additionally, the kitchen also comes with everything you’ll need to prepare your meals such as an iron, toaster, food processor, blender, kettle, Nespresso machine, freezer, fridge with ice dispenser, microwave, electric oven, dishwasher and an electric stove. In the kitchen, you’ll also find a washing machine as well as an ironing board. 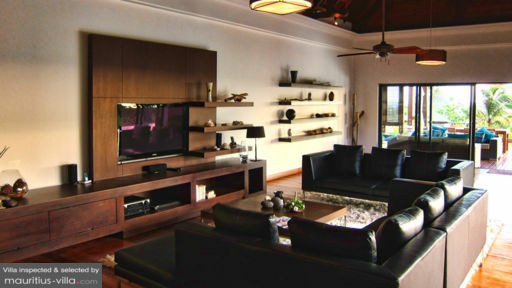 The living room overlooks the tropical garden and includes a 50 inch Plasma television with satellite TV offering both local and French channels. For those lazy days in, you can also make the most out of the DVD player and home entertainment center. In the downstairs living area, you’ll also find a dining room. As a guest of Villa Laguna, you will be able to enjoy the Conciergerie services seven days a week. A housekeeper comes in every day from 9am to 3pm to ensure that you won’t need to bother yourself with tedious house tasks during your holidays. Best of all, a welcome hamper full of wine, water, Nespresso capsules and bathroom amenities is offered to you upon your arrival. To easily help you move on site, you will be able to use a golf cart which has been set up for your disposal. 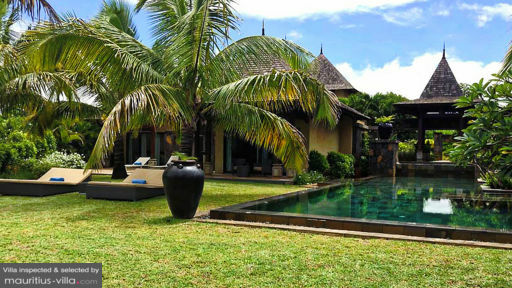 Guests of Villa Laguna have an easy access to So Sofitel Mauritius, a neighboring 5-star hotel. Over there, you can enjoy a variety of non-motorized watersports such as glass bottom boat, snorkeling, paddle ski, pedalo, kayaking, sailing and windsurfing, among others. Around the villa, you’ll also find plenty to explore such as the Vallee des Couleurs nature park which is just a short drive from Villa Laguna.